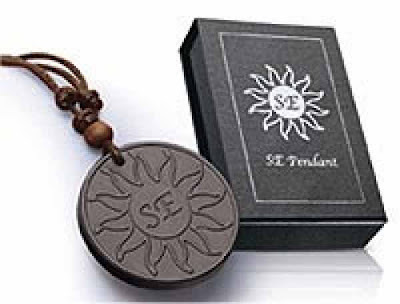 Now, you can achieve better health and greater vitality, by improving body's circulation, neutralizing negative energies, and re-charging your body's energy field with the right energy frequencies with SE Pendant. Energise blood cells & reduce "stickness"
Wear SE Pendant over the neck, or place it directly on the affected body parts (e.g. knee, back, shoulder, ankle, etc.) to relieve stiffness or soreness. SE Pendant turns the water in your body into healthy, energized, small-clustered water! SE Pendant does more than just break down the water molecules and energizing your drinking water. When you wear it, it keeps the water in your body grouped into small cell-penetrating clusters. These tiny clusters of water easily pass through cell membranes, carrying nutrients & oxygen into our cells, and waste & toxins out. This easy passage of water into and out of our cells is what keeps the cells clean, young and healthy. Try out several tests in the separate brochure to experience how SE Pendant is able to improve your flexibility, increase your strength and enhance your balance! SE Pendant is tested to emit FIR, scalar energy and negative ion, free of harmful metals, and contain Germanium 99.999%. Certified by reputable bodies, including Korean Far Infrared Association ( KFIA/ KIFA), Ajou University, Korea, and SGS.